McWhorter Capital Partners and Bartow Street Capital announce plans to raise $150 million in capital to invest in out-of-home advertising company Horton Outdoor. “We are proud of the rapid growth that Horton Outdoor has experienced. The company went from seven billboard structures to 111 structures with more than 450 faces/flips in less than three years,” said Josh McWhorter, CEO of MCP. McWhorter Capital Partners, a private equity and real estate investment firm, is pleased to announce that it is partnering with Bartow Street Capital, a subsidiary of Greenfield Advisors, to raise $150 million for the continued expansion of Horton Outdoor Advertising. Horton Outdoor is an outdoor advertising company that specializes in vinyl, digital, and TriVision boards. 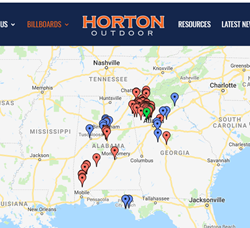 Horton Outdoor is a subsidiary of McWhorter Capital Partners, which also owns various real estate companies, including Lakepoint Realty Group and McWhorter Goss General Contractors. McWhorter Capital Partners is a private equity and real estate investment firm that helps investors grow their wealth so they can live more fully and give more generously. Investment portfolio includes Horton Outdoor, Lakepoint Realty, and McWhorter Goss General Contractors. For more information, visit http://www.mcwhortercp.com. Founded in 1976, Greenfield Advisors is a boutique economic and financial analysis firm that provides government and private sector clients with customized consultations and advisory services. Best known for its analysis of complex economic, financial, and real estate situations in high-profile litigation matters, Greenfield Advisors also develops feasibility studies, business plans, and appraisals for its clients. Greenfield Advisors’ subsidiary, Bartow Street Capital LLC, serves as its investment banking and capital raising arm, and its subsidiary, Accre LLC, acts as an investment principal. Learn more about Greenfield Advisors by calling 770-334-3952 or visiting http://www.greenfieldadvisors.com. *Bartow Street Capital conducts securities business through Bridge Capital Associates, Inc., a FINRA member and SIPC registered Broker-Dealer. This press release may contain forward-looking statements with respect to McWhorter Capital Partners. Forward-looking statements are statements that are not descriptions of historical facts and include statements regarding management's intentions, beliefs, expectations, plans or predictions of the future. Because such statements include risks, uncertainties and contingencies, actual results may differ materially from those expressed or implied by such forward-looking statements. Past performance is not indicative of future results.